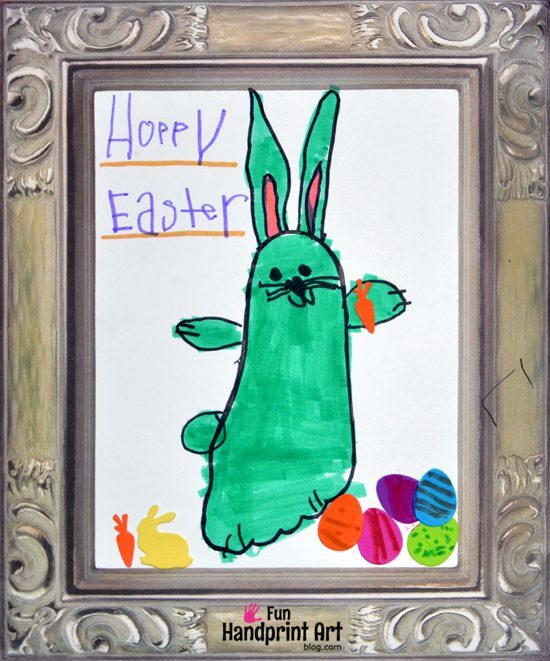 Big Brother has been obsessed with making handprint drawings the past few months, so of course he wanted to create some hand-y Easter ones. In this post, we share the super cute traced hand chick and traced foot bunny drawings he made. We used paper from picture frames drawing pad to make them framed artwork. *This post contains Amazon affiliate/referral links to the products mentioned – We may earn a small commission on items ordered. We love our Melissa & Doug Picture Frame Pad and use it all the time. My little artist loves to draw using these papers and I love how the frames make his artwork look. To make his traced hand and foot drawings, I gave him two different framed sheets which he then used to turn his tracings into coloring book style art. My son started by tracing his hand. 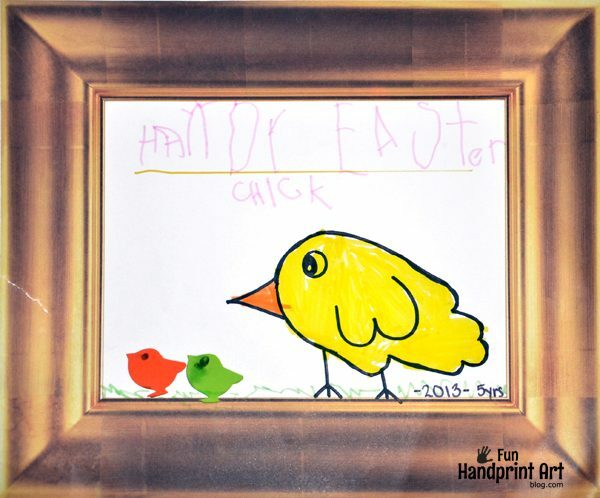 He turned the hand outline into a baby chick by drawing on wings, a beak, eye, and feet. Then he colored it yellow and orange. He wrote the words “Hand-y Little Chick” across the top. To finish, he placed two baby chick foam stickers walking next to the big traced hand chick. → Check out this Hand-y Ocean drawing he made, it’s so colorful & fun! Now the framed hand and foot drawings are ready to be displayed on the wall or refrigerator! *This Traced Hand Chick and Traced Foot Bunny Drawings post was originally published on 4/6/2013 and updated on 3/4/2018.